The Age of Aquarius has become an urban myth – especially in North America. As a result, many people express the opinion online that the Age of Aquarius arrived in the 1960s or 70s and many people even believe that the Age of Aquarius only lasted the 20 years when hippies were prevalent. Most people are unaware of the Age of Aquarius or have a faint memory of it being included in a song at the beginning of the musical production “Hair” first performed in the late 1960s. It was not until around 1987 that my interest turned towards the astrological ages. This only occurred because I was a keen student of astrology since the early 1970s and that I mainly learnt astrology in isolation of other astrologers and astrological organizations. Because I learnt astrology from books and magazines, some of which were obscure, I incorporated uncommon techniques into my practice of astrology. Either as an accident of fate or otherwise, I accidentally learnt the key but eccentric technique commonly called dwadasamsa – a way of dividing each zodiacal sign into 12 sub-signs. Dwadasamsa were instrumental in developing a unique understanding of the mechanics of the astrological ages. I decided to test my hypothetical approach to the ages and quickly discovered that my approach actually worked. Within weeks I could see the correlation between historical periods and the sub-periods of the Age of Pisces and Age of Aquarius. 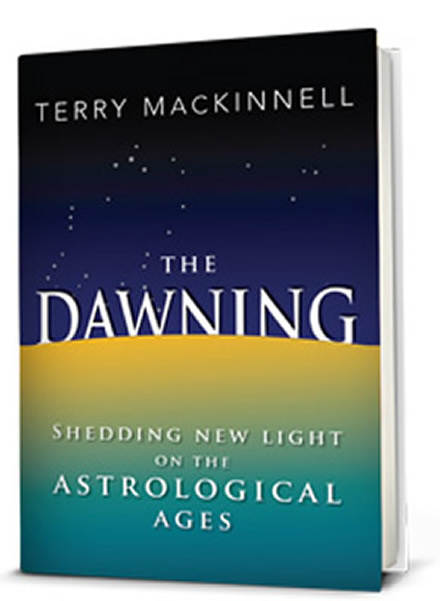 After years of either erratic study and focused research and writing, I published my first book on the astrological ages “The Dawning”. This book was written for the general public and astrologers, and I try to keep both these groups informed of my ongoing study of the astrological ages. It is towards this end that I have collected the core structural knowledge of the astrological ages so that any interested person (with or without astrological knowledge) can appreciate the astrological ages in depth. Very few astrologers have any real knowledge about the Age of Aquarius or the astrological ages in general. Many incorrectly assume that because they are familiar with horoscopic astrology they automatically understand astrological ages. Furthermore, most astrologers parrot fallacious information about the astrological ages assuming that the common information about them is correct. I am setting the record straight. The astrological ages are based on a slow 26,000 year revolution of the Earth’s axis due to the Earth behaving like a spinning top, and it wobbles like a spinning top. It takes around 26,000 for one rotation of a wobble. Divide 26,000 years by 12 and the result is 12 astrological ages of some 2150 years each. Secondly, what differentiate these ages from ‘normal’ astrology is that they move backwards through the zodiac. This is why after the Age of Pisces it is the Age of Aquarius, and after Aquarius will be the Age of Capricorn. Almost 100% of astrologers agree on these two points. However, there is no consensus past these two points other than almost 100% of researchers use the calibration technique to measure the passage of the ages developed by the Ancient Greek astrologer and astronomer Hipparchus in the 2nd century BC. This calibration technique is incorrect as a method to calibrate the astrological ages, and its use by astrologers, for the equivalent of an age, has prevented the development of any real understanding of the astrological ages. The rediscovery of the much older technique of calibrating the astrological ages based on the heliacal rising constellation has supported a totally new perspective of the astrological ages. The redefined astrological ages and their sub-periods provide relevant and valid predictions down to periods of time as small as five months, and in some circumstances, down to 5 week periods. The calibration technique developed by Hipparchus may be irrelevant for the astrological ages, but accidentally or otherwise, it is a valid technique for determining a secondary aspect associated with the astrological ages which will be explained later (quasi periods). Any aspect of astronomy has the potential of providing an astrological insight. In the same way that the ages pass through the zodiacal signs in reverse order, so do the sub-periods – but what determines the order of these sub-periods? Let’s take the Age of Aquarius for example. It has 12 sub-ages. Most astrologers who work with the astrological ages believe that when sub-ages are applied to the ages that each age commences with an Aries sub-age, followed by Taurus, Gemini and so on until Pisces. This approach is another reason why astrologers have not ‘cracked’ the ages. Over 2,000 years ago the Ancient Greeks also divided the zodiacal signs into 12 equal parts, and the approach they took is that the first sub-period is always the same sign as the parent period, and then the following sub-periods follow in natural order. For example the sign Aquarius, when divided into 12 sub-signs, commences with Aquarius, followed by Pisces, Aries, Taurus and so on until Capricorn – the twelfth sub-sign of Aquarius. This system made its way to India and the Indian astrologers called this twelvefold division system – dwadasamsa (often abbreviated in the West as dwad). The dwadasamsa division of Aquarius begins with Aquarius, followed by Pisces, Aries, Taurus and so on until it ends with Capricorn, but this does not mean the Age of Aquarius begins with an Aquarius sub-age – it actually begins with the Capricorn sub-age. This is because in the same way the astrological ages appear in reverse order, when the world passes through the Age of Pisces and enters the Age of Aquarius, it is actually entering the sign Aquarius at its end (not its beginning). When the world leaves the Age of Pisces, it is leaving the sign Pisces at its beginning. It is conceptually important to differentiate between a zodiacal sign and an astrological age. Note: Table 3 is the mirror image of Table 2. The above structure of sub-ages in reverse order to their normal progression through the signs is called the geometric application of dwads. All these sub-periods based on the twelve-fold division of a sign can also be grouped into groups of four called decanates (decans) with three decans per sign. Notice that each decan is an Air sign like its parent sign (Aquarius) and that each decan also begins with the same sub-sign. For example the Gemini decan also starts with the Gemini sub-sign. Table 6 will now show the same concept of decans applied to the Age of Aquarius (in a geometric or chronological fashion). This same approach applies to the breakdown of sub-ages into 12 micro-ages and three sub-age decans, similarly with micro-ages and nano-ages. Notice in Table 6 that each age-decan ends with a sub-age of the same sign and that the Age of Aquarius ends with the Aquarius age-decan and Aquarius sub-age. This phenomenon applies to all ages and sub-periods. This means that the emphasis in each age, sub-age, micro-age etc. is at their chronological end compared to their beginning. When an age (or any sub-period) commences, it begins at its weakest point and slowly builds up momentum reaching its peak of energy at its very end. Therefore at the end of the Pisces age, Pisces is at full power and this momentum does not just disappear when the age changes to Aquarius. This momentum continues on into the Age of Aquarius like a tsunami while Aquarius behaves like the new weakling kid on the block and no match for Pisces. WHEN DID THE AGE OF AQUARIUS DAWN? Tables 7a displays ages with age decans and sub-ages while Table 7b displays the first four sub-ages in the Age of Aquarius with their respective micro-ages (but no binary terms or overflow periods). The basic or core structure of the ages and sub-periods are established by the geometric application of dwads as described above. However, another structure can be derived from the core ages and their sub-periods that provide great utilitarian value. This alternate structure is based on the intersection of waves. Each age (and sub-period) is a wave. When a new period start, its power is weak and it gradually build up its momentum until its end then washes over the following period. But at which point does the growing period overtake the influence of the previous period. For example, when does the growing power of the current Age of Aquarius overtake the Pisces tsunami from the previous Age of Pisces? The answer is the midway point. Midway through the Age of Aquarius is 2503 AD. Past this point the Pisces age overflow continues, but is now subordinate to Aquarius. Now Pisces had its own tussle with Aries an age before, and in 352 AD Pisces overtook Aries and became the dominant sign. Therefore from 352 AD to 2503 AD Pisces is found first in the Aries-Pisces age (732 BC – 1433 AD) then in the Pisces-Aquarius age (1433 AD – 3574 AD). 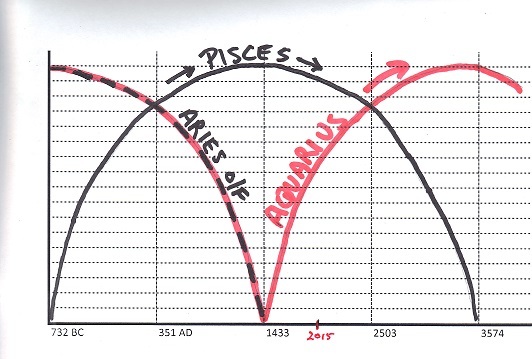 But between 352 AD and 2503 AD Pisces is the king pin, and so this period is labelled the ‘Pisces quasi age’. The same approach can be taken with sub-ages, micro-ages, nano-ages and their respective decans to produce quasi sub-ages, quasi micro-ages and quasi nano-ages plus quasi decans associated with all these sub-periods. Note: the Pisces quasi-age, (and all other quasi-ages), is closely aligned to the normal or traditional period of time assigned to the Age of Pisces based on Hipparchus’ Vernal Point method of calibrating the ages if we ignore the Jesus red-herring. However most astrology books have the Age of Pisces commencing with Jesus despite the fact there was absolutely no justification for doing so based on Vernal Point method developed by Hipparchus to calibrate the ages. Therefore the Vernal Point method of calibration developed by Hipparchus an age ago is symbolically relatively accurate for calibrating the quasi-ages, but not the real ages. However, it is important to understand that the relationship between different levels of quasi periods is eccentric (i.e. between quasi-ages and quasi age-decans and quasi sub-ages as an example). The quasi-decans of any period always align in time with their parent quasi-period. For example in the above table, the Pisces quasi age (352 – 2503 AD) conveniently has three quasi-age decans exactly interfacing with the quasi age. For example the Cancer quasi-age decan (352 – 1072 AD) plus Pisces quasi-age decan (1072 – 1791 AD) and Libra quasi age-decan (1791 – 2503 AD) all conveniently fit into the Pisces quasi age (352 – 2503 AD) but the standard system of decan division falls apart in quasi periods as the ‘normal’ three decans in chronological order are Scorpio followed by Cancer and finishing with Pisces. The distortion at the next level down with sub-ages is even greater. Therefore the internal structure of quasi-periods is determined from the core structure of the ages and their sub-periods, and not from their parent quasi period. For example, the quasi-sub age decans cannot be derived from the quasi sub-age but from the real sub-age only. However the borders of quasi-periods and normal periods always align, one way or another. The overflow effect does not apply to quasi-periods. The superimposition of the Pisces quasi-age on the Pisces age and overflow creates four stages roughly equivalent to the four stages of the lunation cycle. The most powerful stage is always stage 3, followed by stage 2 (with both these stages equivalent to when the moon is 50% or more lit up by the sun). The third strongest stage is stage 4 and finally the weakest stage 1. These stages and especially their borders provide concise and significant historical correlations. Let’s take Ancient Rome as an example. The village of Rome was settled within a few years of 732 BC, at the beginning of the Pisces age (and Pisces era and Aries age overflow). Rome was the empire of the Aries-Pisces age. Its final collapse occurred within a few decades after the end of the Pisces age in 1433 when Constantinople, the capital of the old Eastern Roman Empire, fell to the Ottoman Turks. What happened at the midway point in 351 AD? It was in this century that the Roman Empire split into two parts – the Western and Eastern Roman Empires. This was the time the Aries quasi-age came to an end and the Pisces quasi-age arrived. Aries is a mono sign while Pisces is a key dual sign, and like the two Pisces fish, the formerly united Roman Empire split into two. In less than 100 years Rome was sacked and defeated a number of times and the Western Roman Empire came to a virtual end, but the Eastern Roman Empire continued slightly past the end of the Pisces era in 1433 AD. Though these quasi periods provide great insight on the flow of energy in ages and sub-periods, they always remain subordinate to the ages. The Roman Empire may have significantly split into two with the arrival of the Pisces quasi age at the midpoint of the Pisces era, but Ancient Rome existed well before this point and the Eastern Roman Empire survived well past this point. Even the Western Roman Empire survived for a few centuries past the midway point. For example, the Western Roman Empire senate survived until somewhere between 603 and 630 AD. Each period (age, age-decan, sub-age etc. ), excluding quasi-periods, are stronger after their actual period in what is called the overflow effect. When an age plus its overflow period are combined, it creates an era. The world is currently in the Pisces era (and still fighting over religion). Quasi-periods are derived from the core structure and the quasi-period associated with any age, age-decan, sub-age etc., always commences at the exact middle of the age, age-decan, sub-age etc. The Dawning is published by Xlibris. All books purchased through Xlibris provide the maximum amount of royalty to the author. Xlibris can supply all three versions of the book – ebook, softcover and hardcover. Books purchased from Xlibris are distributed from the USA or UK but are not signed by the author. “Roman Senate.” Wikipedia, 27 Feb. 2012. Web. 7 Mar. 2012. I’ve always enjoyed your research into the astrological ages. It would be a great piece for the ISAR Journal. We have your book advert. Oh this makes sense to me. My birth date is on the cusp of Aquarius / Pisces (18th Feb) and the World Age is interesting to me. Looking at the quasi age decans I noticed Leo 1824 – 1096 BC, isn’t this around the time of the Yellow Emperor of Japan? Are the myths telling us more than history here?